For many fans, Queen's operatic rock music is an escape - a passport to a world with zero judgment and catchy chants. For Princess Diana, it was a literal escape - one that included drag, reruns of Golden Girls, and 20 minutes at a gay bar. Queen frontman Freddie Mercury became close friends with the "People's Princess" in the mid-'80s when Diana's every move was heavily monitored by the media. According to a memoir by actress Cleo Rocos, she, Mercury, and the princess were sipping Champagne and watching reruns of Golden Girls at the home of comedian Kenny Everett one evening, creating their own subplots for the sitcom, albeit with a "much a naughtier storyline." When Diana found out Everett, Mercury, and Rocos were headed to the infamous gay bar Royal Vauxhall Tavern later that night, Diana asked if she could tag along. The group was skeptical at first - Royal Vauxhall was known for its rough crowd and bar fights. The media would have a field day if Diana was ever caught in the middle of a brawl in a gay bar, yet Diana insisted she still go. "Go on, let the girl have some fun," Mercury reportedly said. The group concocted a plan: Diana would disguise herself in the drag costume Everett planned to wear that night. They dressed the princess in an army jacket, aviator sunglasses, and a leather cap. Rocos described the attire as that of a "rather eccentrically dressed gay male model." The disguise was a success. The crowd was so distracted by Mercury, Everett, and Rocos that they didn't notice Princess Di making her way to the bar. She sipped on white wine and beer and enjoyed her freedom for the entire 20 minutes they stayed (the group didn't want to push their luck) before making her way back home to Kensington Palace. Diana's brief royal night out is one of music's little-known tales. It received the theater treatment in 2016 with the musical The Royal Vauxhall, which was named after and performed at the bar where the outing took place. 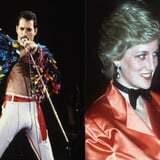 The princess and Mercury remained friends until the singer's death from AIDS in 1991. (Both Mercury and Everett died from the disease.) Diana became the patron of the National AIDS Trust following their deaths, devoting her efforts to promoting the awareness and prevention of HIV and AIDS. It wasn't the first time she lent her support to the cause. In 1987, Diana was invited to open the UK's first AIDS ward where she was photographed shaking hands with AIDS patients, challenging the belief that the disease could be passed on by human touch. While Diana and Mercury's legacies will be remembered for decades to come, that night of freedom the two shared will be forever theirs.